2016 CADILLAC ESCALADE Printer Friendly Flyer. 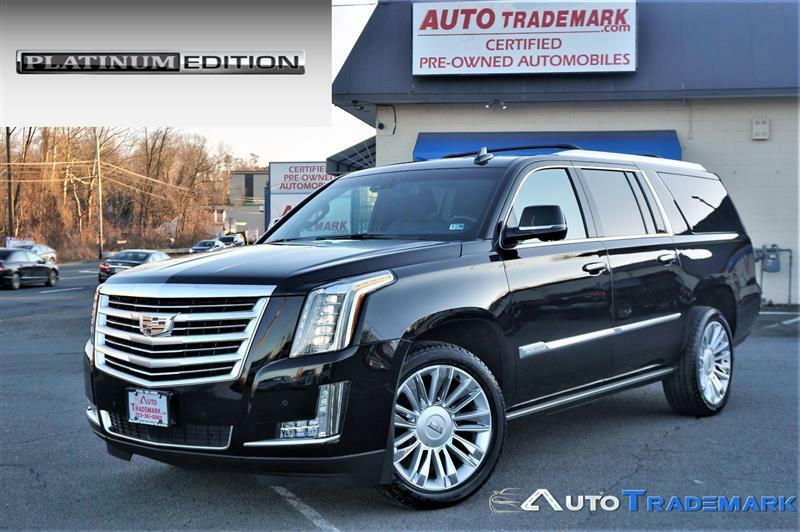 1 Owner, Only 32 K Miles, Full Factory Warranty, 2016 Cadillac Escalade ESV Platinum Edition, Black Diamond Tricoat w Gry/Dark Gray Interior, Loaded with Head Up Display, Dual Dvd Screens, 22 Inch Wheels, 3rd Rear Seat, 2nd Row Bucket Seats, AWD, A/C Seat(s), Wireless Charging Pad, Wifi Net Work, ABS Brakes, Air Conditioning, Alloy Wheels, AM/FM Stereo, Automatic Transmission, Collision Warning System, Auxiliary Audio Input, Blind Spot Monitor, Bluetooth, BOSE Sound System, Cooled Console, CD Audio, Adaptive Cruise Control, Push Button Start, Front Seat Heaters, Full Roof Rack, Rear Entertainment Sys, Heated Steering Wheel, Lane Departure Warning, Overtaking Sensor, Leather Seats, Memory Seat(s), Navigation System, Overhead Airbags, Parking Sensors, Power Liftgate/DeckLid, Power Locks, Power Mirrors, Power Seat(s), Power Windows, Pwr Folding Third Row, Automatic Safety Belt Tightening, Rear Air Conditioning, Illuminated Door Handles, Rear Defroster, Rear Seat Heaters, Rear View Camera, Remote Start, Power Running Boards, Satellite Radio Ready, Led Lights, Side Airbags, Smart Key, Sunroof(s), Traction Control, Financing And Extended Service Plans Available. features includes lane-departure and forward-collision warnings. A Safety Alert seat vibrates to warn of a potential accident. Head up Display, Forward Collision Warning, Lane Assist, Parking Assist, Blind Spot, Stolen Vehicle Tracking, On Star, A Drive Assist group adds adaptive cruise control and collision preparation. Automatic braking also is optional, warning of rapidly approaching obstacles before applying brakes. On upper trim levels, driver-awareness features have been made standard equipment rather than optional. Escalades are outfitted with several levels of vehicle security to reduce the chance of theft.